One of my alltime favorite photographic endeavors is the Portland Grid Project. This is a powerful project on a number of levels, but for me it appeals in an every-day personal way. There is only one rule: "Go into a certain part of the city and make photographs", with no restrictions or directions beyond that. Since this is what I'd be doing anyway, taking part in the project is a snap, and by providing a geographic focus and a guaranteed audience, the PGP offers even more incentive to go out and make photographs. When I lived in Portland, I could cover pretty much an entire grid (roughly 2 square miles) in a month. By the end of each month I'd seen and at least contemplated photographing every publicly visible space in that grid. Now I no longer live in Portland but I am still part of the project. I visit the city in spurts, as a visitor, and these spurts do not allow time to cover an entire grid in a month. Instead, I need to pick and choose spots that seem interesting. Although this seems to be the strategy of most grid participants, it defeats part of the project's mission. By self-selecting "interesting" areas, I am subverting the PGP's premise that interesting things can be found anywhere. So I'm beginning a grid project in Eugene. I've divided the metropolitan area into 58 grids, drawn them at random from a hat, and contacted a handful of local photographers to join me. Our first grid is F3. At roughly one grid per month, the project should last about five years. 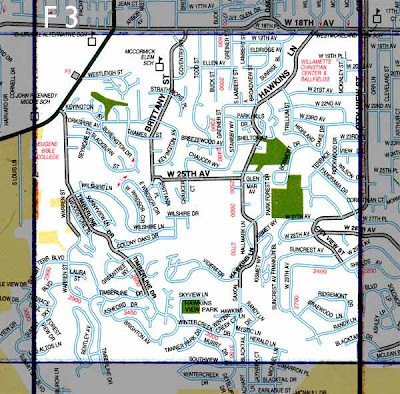 I expect to cover each grid completely, so that after five years I will know every street in Eugene. What a great way to learn a city! Expect to see periodic grid photos appearing on this blog over that time.